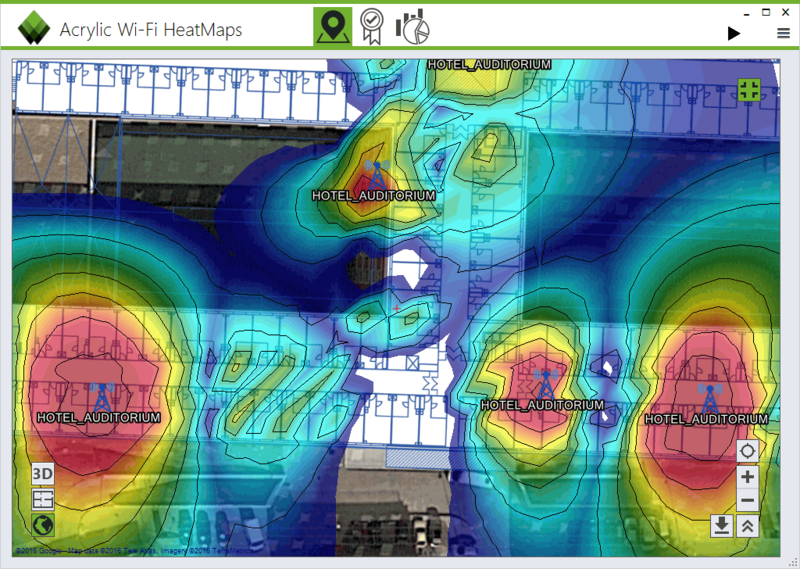 Looking for powerful WiFi heatmap software? 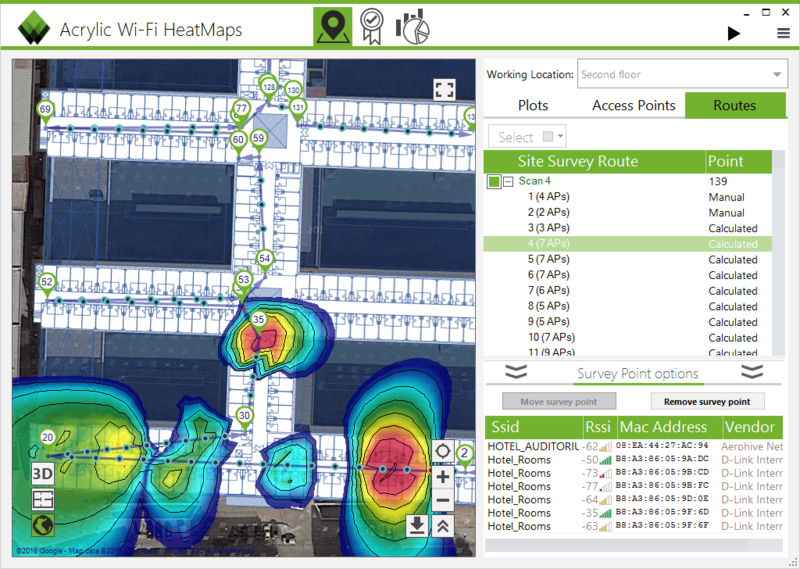 After having learned how to create a Wi-Fi site survey project using Acrylic Wi-Fi Heatmaps, and how to calibrate a map for a site survey analysis, in this tutorial we will go over the process of generating a Wi-Fi heatmap, also known as Wi-Fi coverage map. 1- Go to “Survey” section on the left side menu. 2- Select the location for which you are generating the heatmap on the upper bar selector. In our example, it will be “Second floor”. 3- Select the “Plot Results” tab. Optionally, you can select the Satellite or Blueprint view. From this window, you can select a network name, a specific access point, or multiple access points. After your selection, a Wi-Fi heatmap will be automatically generated, showing the access points coverage ranges within the surveyed area. If the selector on the bottom left area “Gradient lines” is enabled, the Wi-Fi signal strength curves associated with the heatmap will also be displayed. 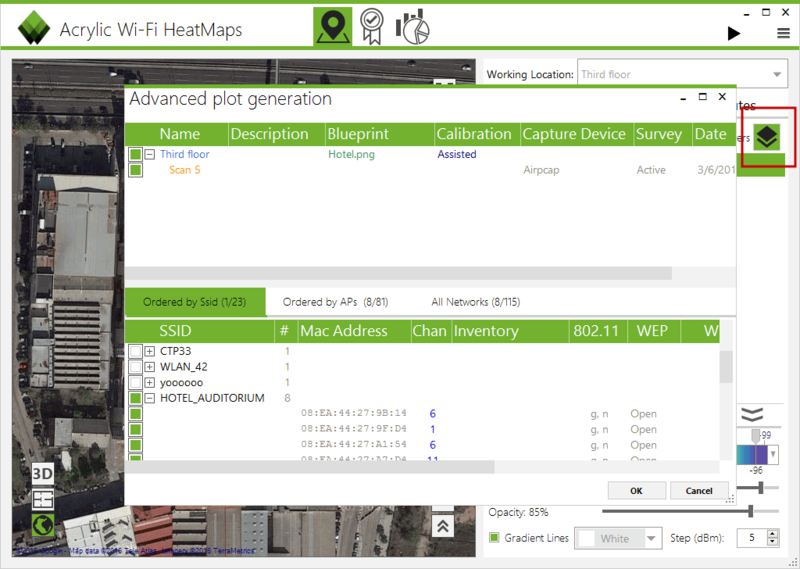 The Wi-Fi survey tab collects the information from all the access points for which measurements have been performed. In this section, it is also possible to select the measurement points and the Wi-Fi network access points locations. This process can be applied to all the existing networks within each one of the surveyed locations, for example, the hotel “First floor”. 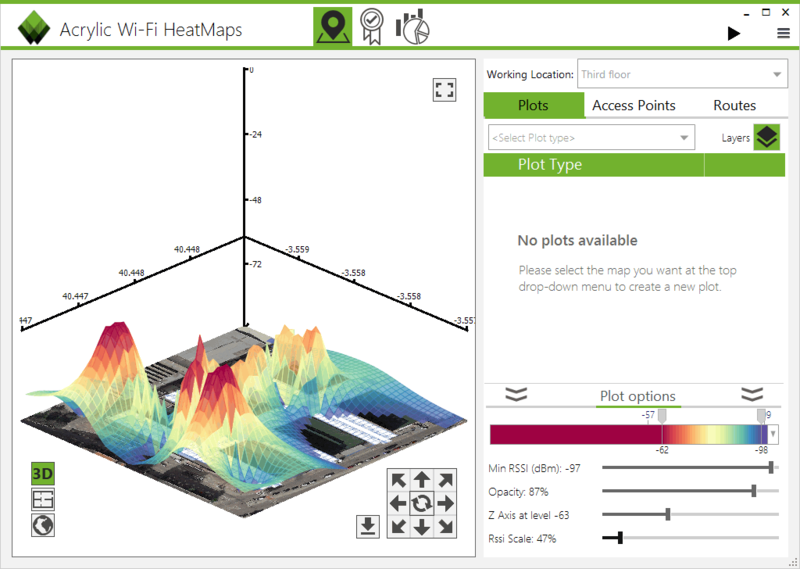 Each one of the icons on the “Plot results” tab generates a Wi-Fi heatmap with different attributes, such as Signal-to-Noise Rate (SNR), access point overlapping, or coverage distribution by Wi-Fi channel . The Wi-Fi heatmap color scheme, and the value range scale to display can be change at any time. 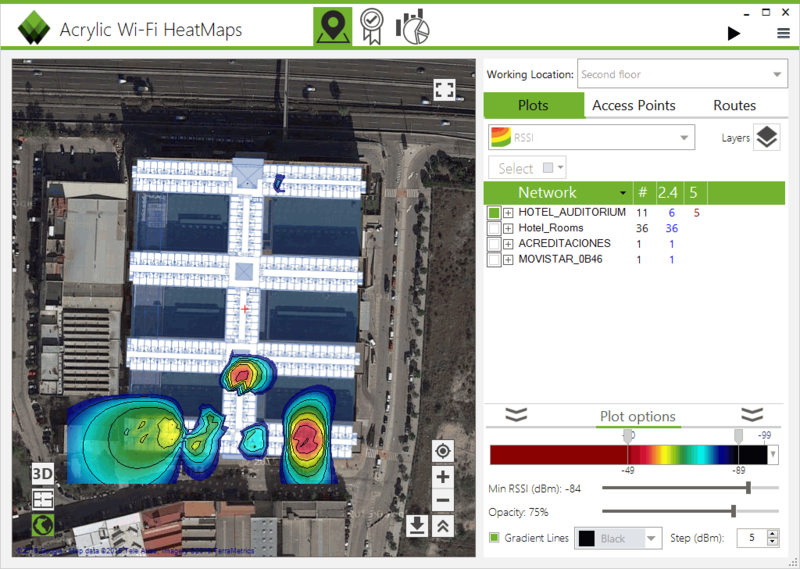 All WiFi heat maps can be exported as an image or geolocalized KMZ file. 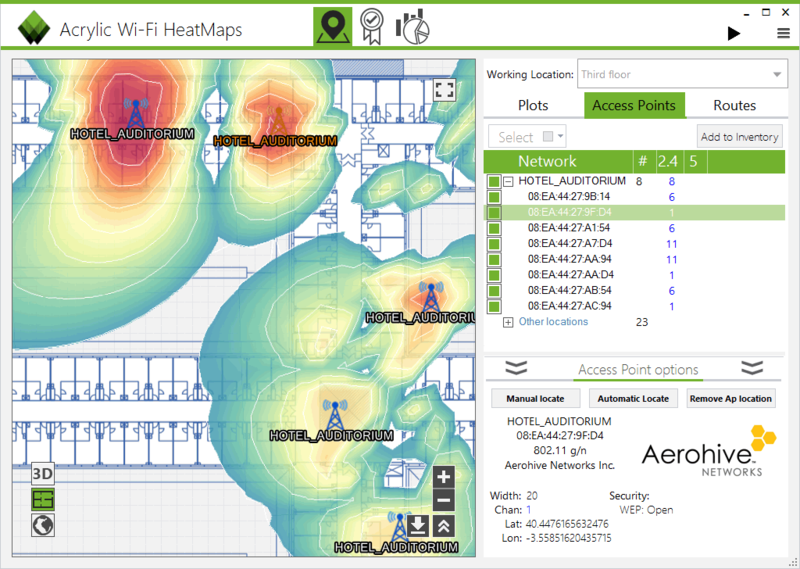 The Wi-Fi heatmap generation mode used until now has been the “normal” mode, where only one Wi-Fi access point or network can be selected while displaying one map at the same time. For more flexibility, you can switch to the advanced mode. 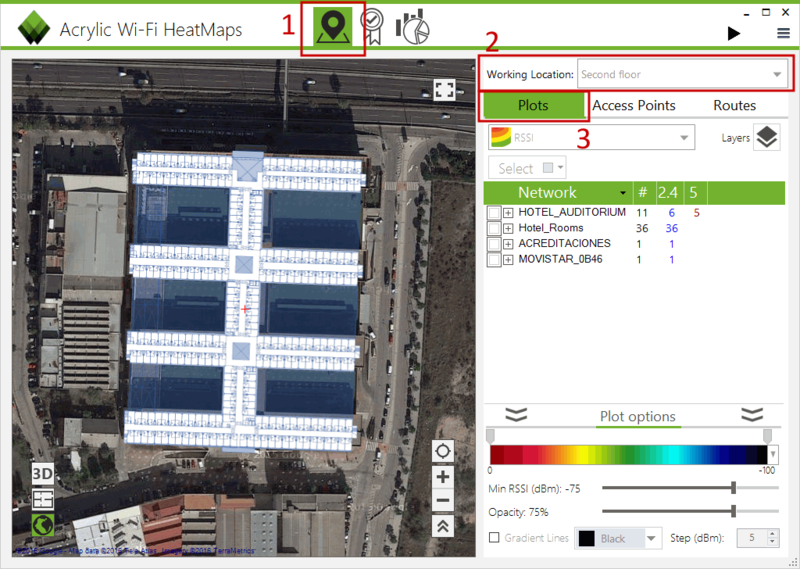 By clicking on the map selector on the advanced menu, you will be able to select the type of Wi-Fi heatmap to generate (Wi-Fi heatmap with RSSI signal strength levels, Signal-to-Noise Rate (SNR) map, AP coverage map, etc.). In this new window, you can select the number of scans that will be applied and which networks or access points will be included. When selecting the “View 3D” button, the Wi-Fi heatmap for the selected network will be displayed in 3D. The controls on this windows allows you to rotate the Wi-Fi heatmap and select attributes such as color range or signal sensibility. 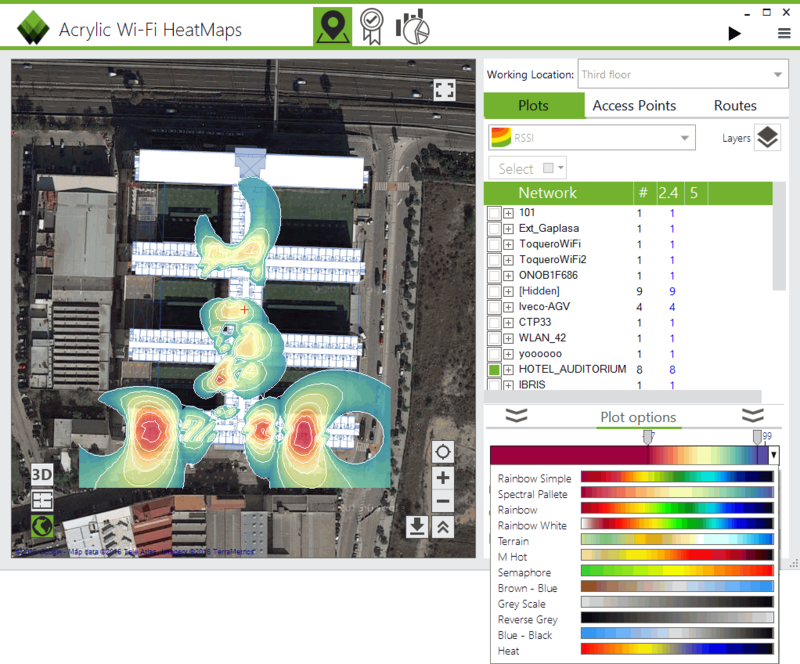 Acrylic Wi-Fi Heatmaps version 2.0 simplifies the Wi-Fi heatmap generation process, while offering the same powerful features. Download the free trial version of this Wi-Fi site survey software. Wi-Fi network quality: how to measure it?